In this drawing tutorial we will show you how to draw a Rolls-Royce Phantom – one of the most prestigious and legendary cars. The current Rolls-Royce Phantom is the predecessor of the classic Phantoms which has details of its ancestors, such as a vertical grille, borrowed its appearance from the Parthenon with the spirit of ecstasy on its top. So, let’s get started! First of all draw a rectangle as in our example, which will be the base of our Rolls Royce. Over the rectangle draw a roof using a curved line. Note that unlike other cars of cars of this class the Rolls Royce Phantom has a lot of straight lines. In the front part of Rolls-Royce sketch out the radiator grille with light straight lines. On the sides of the radiator grill we draw rectangular headlights. Using a light line sketch out the bonnet. With two straight lines draw the upper triangular part of the grille. 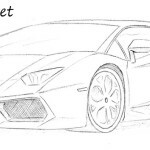 Sketch out the front arch and wheels. Sketch out the outlines of the windows, doors and mirror. Draw the rear arch and wheel. Make the back of the car sloping like in our example. So, let’s get down to the details. Give it a three-dimensional appearance, as in our example. The lines on the grille must be at the same distance from each other. We continue to drawing the front part of the Rolls-Royce. 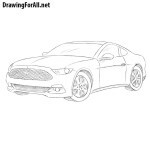 Accurately draw out rectangular headlights. 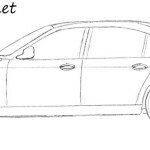 Draw the remaining front part, a bumper and registration plate. Erase all the guidelines from the front of the Rolls-Royce. Draw out the bonnet with long straight lines. Draw the arches with a curved line and a wheel that looks like an even oval. Draw the details of the roof of windows of our car. Carefully draw out the rear-view mirror. As we have already said, all the lines on this car are straight or practically straight. Draw the wide doors of Rolls-Royce Phantom with the famous handles that are at the junction of the two doors. 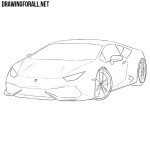 And finish this step by drawing the back of the car, the rear arch and the wheel, which is drawn the same way as the front. Add a few important details. At the very top of the radiator grill draw the spirit of ecstasy – one of the most known parts of the Rolls-Royce. And at the very end, draw rims with the Rolls-Royce logo in the very center. It was a drawing lesson on how to draw a Rolls-Royce Phantom! If you like cars then visit our lessons about Lamborghini and Mercedes Benz. Also share this lesson and come often to our site for new drawing tutorials! That is insanely good. What I would really like though are some M series BMWs. 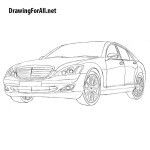 We have a lot of drawing tutorials about the BMW M series, for example how to draw a BMW M5 http://www.drawingforall.net/how-to-draw-a-bmw-m5/.